MANILA, Philippines - Malacañang Palace through Memorandum Circular No. 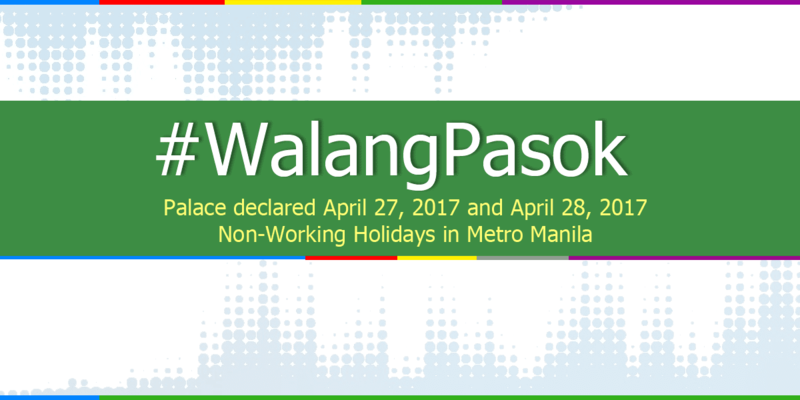 18 declared April 27, 2017 (Thursday) non-working holiday for government offices in the Cities of Pasay, Makati and Manila while non-working day in entire Metro Manila on Friday, April 28, 2017 (through Proclamation No. 197) due to Philippines' hosting of the 30th ASEAN summit. The 30th ASEAN meeting of leaders will be held on April 29, 2017 at Philippine International Convention Center (PICC), Pasay City. 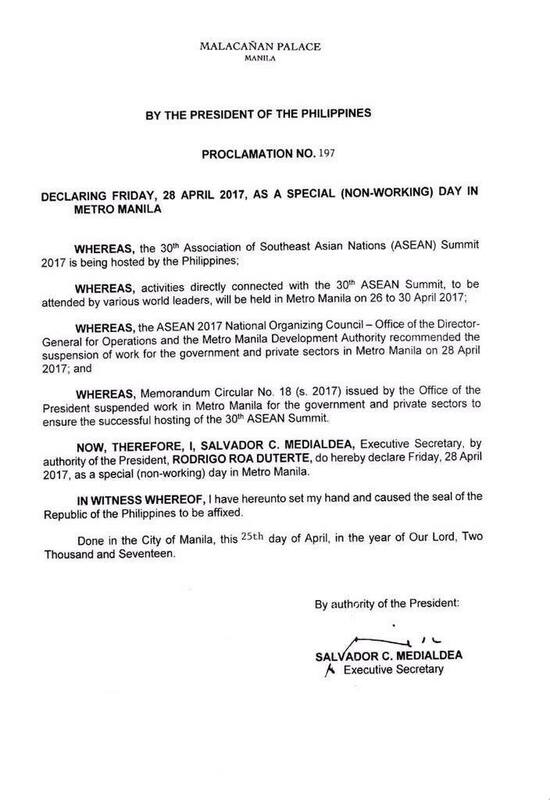 As per Memo, the suspension of work was made upon the recommendation of the Association of Southeast Asian Nations (ASEAN) 2017 National Organizing Council - Office of the Director-General for Operations and Metro Manila Development Authority (MMDA). Here is the summary of areas where work has been suspended. The suspension also aims to to ensure uninterrupted delivery of public service and government transactions inside the PICC and CCP complex. They may likewise process their transactions at other branch offices of related agencies. Meanwhile, those government agencies under basic services, health and safety, emergency and other offices directly involved with ASEAN 2017 shall remain open and continue with their operations. Classes in public and private schools are also suspended on April 28, 2017 while class cancellations on April 27, 2017 in the cities of Manila, Pasay and Makati will be at discretion of respective school heads. Below is full text of Proclamation No. 197 and Memorandum No. 18. 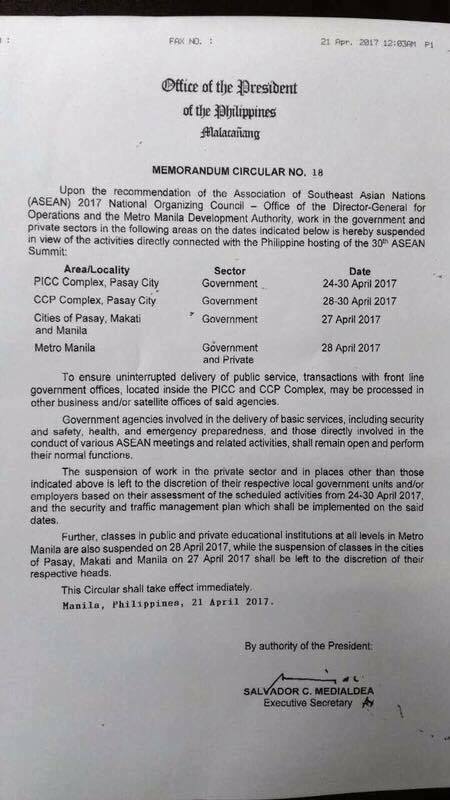 Professional Regulation Commission (PRC) already advised the public that its offices located at PICC complex will be closed from April 21, 2017 to April 28, 2017 due to ASEAN Leaders' Summit events. Bukas po ba yung mga Satellite Office ng DFA? All offices in the DFA Main Building (Roxas Boulevard), including the DFA Satellite Office in SM Manila are closed to the public today, 27 April 2017. All Satellite Offices within Metro Manila will be closed on 28 April 2017. Is DFA open today? Pls. Reply i'm applying passport today? What about those with appointment on April 28 in DFA? How about prc in recto is it open today?